Gail Rudd Entrekin is a poet, editor, publisher, teacher, quilt maker and hiker. 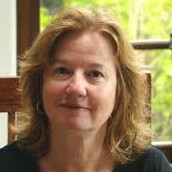 Books of her poems include John Danced(1988), You Notice the Body (1998) and Change (Will Do You Good) (2005), which was nominated for the Northern California Book Award. Her newest collection of poems, Rearrangement of the Invisible, was published August 1, 2012. Her poems have been widely published in poetry magazines and anthologies. She is co-publisher and Poetry Editor of Hip Pocket Press, where she served as Editor of the 2002 anthology Sierra Songs & Descants: Poetry & Prose of the Sierra and the 2007 anthology, Yuba Flows. She is Editor of the on-line literary magazine of the environment, Canary, founded in 2007. She has taught English and Creative Writing in California community colleges for 25 years, most recently at Sierra College in Grass Valley, and for many years she has taught poetry to kids through California Poets in the Schools. She currently serves as Director of the Entrekin Foundation, a funder of non-profit programs for the endangered environment, children, and the arts.